What would be the best way of combining these two UIs? 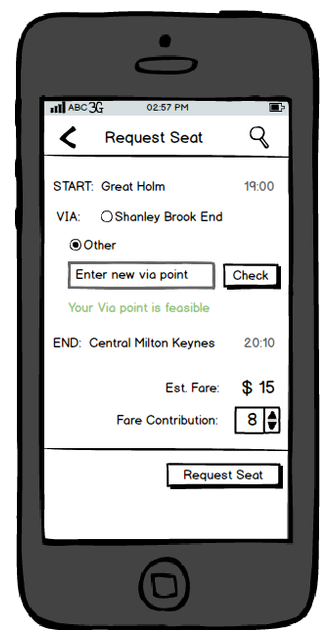 I'm in the process of redeveloping a "request seat" page for a taxi sharing application that I am working on. 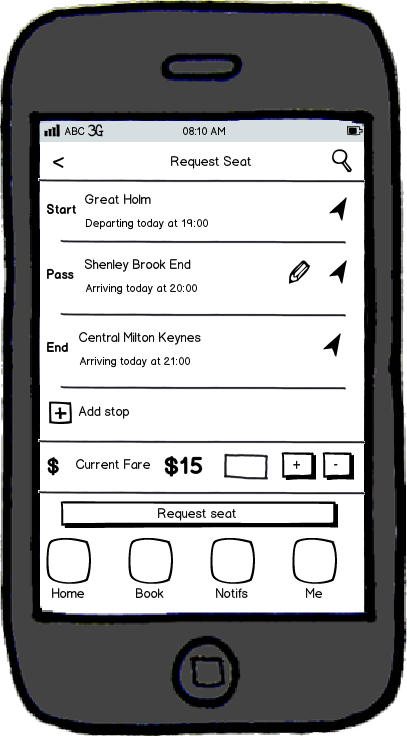 Users can request a seat on a booking made by another user - this page allows them to view the cost implications of having an additional pickup/dropoff on a journey. Not sure if radio buttons are commonplace on mobile apps, but it helps the user determine whether they want to be picked up at Shenley Brook End or somewhere else, I like this a lot. I see the need for the edit (pencil icon)/map (pointer icon) functionality, but does it look out of place? I feel there is a duplication of functionality with the edit/add-stop feature... perhaps drop one for the other? If I understand correctly, you have to chose the start then the end and fill the in-between. It seems a bit complex. If I try to simplify, you're creating a route so you could start with an empty one and add points. I think your second proposition is better, there is not that much things to improve. NOTE : the phrase "Where do you want to get through" is probably not the best and leave place for confusion. It should update depending on the state of the process. In example, when there is no points yet you could ask "Where will we get you ?". Second one is better. Remove "edit" option because there is already an "add" option but put "delete" option inplace of edit. Request seat button needs to be little bigger. First one has small fare contribution buttons, too small. "Via other" you can use in second in add option. The top section of the second does seem better. I would skip the edit and map buttons, replacing them with a chevron and a details screen. The estimated fare + contribution is much less clear in the second option though. Also, what does the search icon on the top right do? Perhaps you could use that spot for a "+" to add stops? Not the answer you're looking for? Browse other questions tagged usability forms user-behavior mobile-application or ask your own question. What are the type of settings you would expect to see in a taxi-sharing application? How would I reflect the possible changes to the journey that could follow a decision? Which of these two user interfaces would be more efficient in summarizing a support ticket?